This is the best unit in the Black Diamond building. This warm and inviting 3 bedroom condo has gorgeous views of ski hill and surrounding mountains. No one above you, and the mountain in front of you. 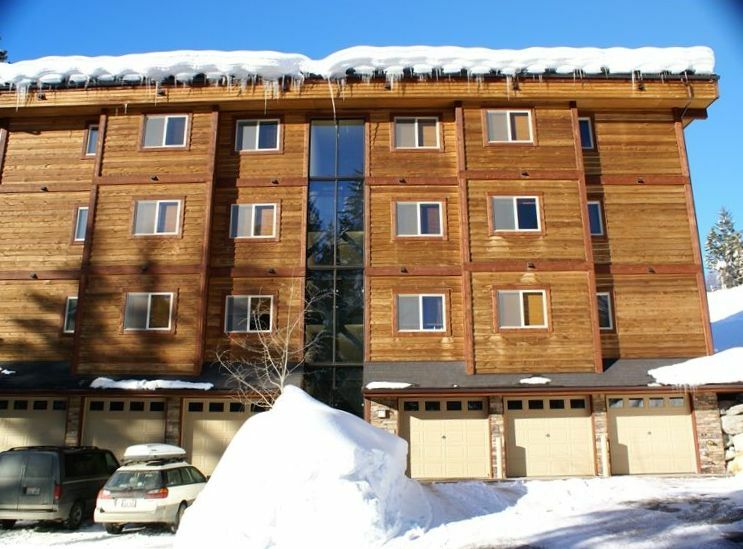 Ski locker, elevator, and easy access to chair lifts make it convenient, while the hot tub, gourmet kitchen, and radiant heated floors make it luxurious. This is the penthouse unit in a beautiful building with just 5 other condos. Whether you're a skier, a hiker, a golfer, or a boater, this is the perfect 'home base' for all your local adventures. Whitefish Mountain Resort offers world-class downhill and telemark skiing on Rocky Mountain powder. Cross country skiing is available on the mountain as well, with several other groomed places close by. Glacier Park is just 45 minutes away by car, offering endless hiking, kayaking, or whitewater rafting possibilities. Closer to home, the Danny On Trail starts steps away from our front door, taking you to the top of Whitefish Mountain in the summer! The chair lifts carry you and your mountain bike to the top of exciting trails, or simply ride the lifts up and down to enjoy the incredible views from the top. The newly remodeled restaurant on top is also open in the summer for food and drinks. New activities on the mountain include 7 high speed zip lines (one of which is 1900ft long and 305ft above ground at its highest point), a mountain slide (luge) for all ages, and a high ropes course, with 4 different levels of difficulty so all skill levels can participate and enjoy. There is also a mountain slide; a luge run for which is fun for all ages. There is a lot of activity on the mountain in the summer as you can see, and beautiful sunny weather as well. Flathead and Whitefish Lakes beckon to boating and jet-ski enthusiasts, while great golf, fun shopping, fabulous dining, and gallery hopping await you in and around the charming town of Whitefish. In 2013, Whitefish was voted the best restaurant small town in the country. We live in the state of Washington, but spend several weeks enjoying the powder of the mountain in the winter, and several weeks enjoying the warmth of the area in the summer. So much to to do; so many great restaurants to try. Never a lack of outdoor adventures, and Glacier National Park is so close and so cool. This is the penthouse unit with views up the mountain. No footsteps above, just awesome views and quietness. This 3BR, 2BA unit with 1350 sq. ft. of living area is spacious, allowing everyone some room. An elevator takes you up from our heated garage, to a unit with heated floors, a granite fully equipped kitchen, a gas fireplace, cable TV, internet, and a hot tube shared with only 5 other units. There is a weber grill on the deck, as well as games, books, puzzles, an iPod stereo system, and some wonderfully decorated walls and mantles to enjoy. There is easy access to the village, and just a short walk or ski down to the ski trail which takes you to the base lift. Yet, at the end of the day, you are once again away from the extra noise of the village and the hordes of people if you so choose. There is no foot stomping overhead, and the elevator in the building is against the unit across the hallway, i.e.., it's quiet when you need it to be quiet. toilet, combination tub/shower, Granite counter with nice forged accents. We are in the Whitefish Mountain Resort. We are just steps below the Whitefish Mountain Village with its shops, restaurants, and bars. Uphill view of the village and mountains. A short walk down the street. All bedding, towels, washcloths, and hot tub towels. Just use code listed on the router. Lots of towels, and hot tub towel available. Seats 6-8 in kitchen nook. Paperback library, take, read and relax. Don't finish, take it home. Various board games and puzzles. Views up mountain, gas grill. Rent a boat down at Whitefish Lake,...or a Jet ski. Looks up at the village and the Whitefish Mountain Ski Resort. We are in the Whitefish Resort. Come play in the Rocky Mountain powder. Golf courses all over the valley. Thanks, Rolf and Margie, for renting us your property for the weekend. Conditions were great! The penthouse is quite lovely, and the location couldn't be better, with true ski-in-ski-out access. Would certainly consider booking again. The nicest accomodation we have stayed in on Big Mountain in seven visits over fifteen years. The property was clean, well appointed with plenty of space, more than adequate facilities and excellent views. There were many DVD's games and books to keep us amused in the evenings. The place was always warm with good showering facilities and, of coure, the hot tub. Access to the slopes was relatively easy as it snowed every day we were there and so we could get start the day by skiing (and poling) to Home Again, and end the day sking to the road outside the property and sliding down the slope to the condo. If there is no fresh snow, the walk to Home Again in the morning and the walk back in the evening is quite arduos. The big issue was access and communication with the host and/or rep. On arrival the garage key press did not work, (nor dusing the stay). The front door key in the other keypress was missing so we could not get in. As we were early we informed the rep that we would be back at the property at checkin time but she was not there to meet us. (It was well below freezing point and we had been travelling for 25 hours so NOT a good start). When the rep arrived she appeared to know about the fault with the garage but had not checked it out prior to our arrival. (Why not?) She alos said the faults would be rectified. She never contacted us and we never recieved the missing key and the garage door could never be opened from the outside. I consider this very poor service and a complete lack of communication from the rep. The other issue we had was a leak from the kitchen, only obvious to us when the downstairs occupant camd up to inform us that water was running through his ceiling. There was a large pool of water under ur sink so I reported it to the rep who said she would send the plumber the next morning. The plumber did not arrive and we eventually made arrangements via the cleaner who was in the block at the time. When we left the garbage disposal unit was not working, which we suspected was the cause of the fault in the first place. We also tried to contact the owners by email to inform them of our difficulties but never received a reply! We would definately like to stay again, but trust that by then there is a communications network in place between the owners / rep and visitors. In our experience it is a great place to stay unless something goes wrong as it is difficult to get problems sorted. The condo was fantastic it was great to have the hot tub close by and an elevator in the building. The amenities in the condo were great. Thanks! The condo was extremely convenient to the mountain. In all honesty, I can’t say that that it was ski 🎿� n ski out with kids. If only adults... a short clip across a flat parking lot will be all it takes. I loved how clean the condo was and the entire building smelled freshly painted. Our family would definitely rent this place again...and we are picky. Well stocked and clean. loved it. We enjoyed our stay. Only one thing and it was close to 100 degrees. .. there is no AC and the hallway was steaming there is no window!. Plenty of towels and dishes and nice view. Our main attraction was Glacier NP and it was a little too far to drive everyday but for the winter it will be your perfect place.